A lot of people react in abject horror or skepticism when Neil and I say that we make sushi at home on weeknights. They assume it must either be the complete trailer park of sushi, or that it’s not really sushi at all but a horrific science experiment. I’m happy to say it’s neither, and with a few techniques and simple ingredients anyone can make great sushi at home. Our recent favorite creation: a super spicy crab roll I like to call “Kowabunga Kohler Crab Roll.” Yup, I’m a total cheeez. Always to wash your rice with water until it runs clear and is no longer milky. 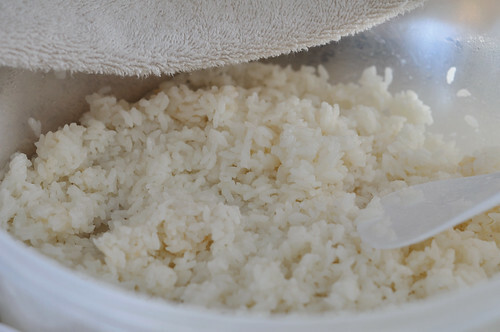 Make your rice in a rice cooker using no less than 2 cups (any less will burn). 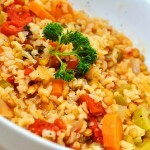 Always use Jasmine “sushi” rice from your local store or Asian Market. Follow exact cooking times for your rice cooker or directions on bag of rice. 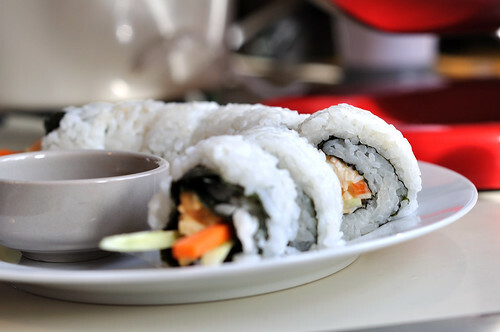 Rice flavoring is essential for that sushi rice taste, it also helps the rice stick together. 1. Heat vinegar, sugar, and salt in a pot until sugar is dissolved, set aside. 2. When rice is done cooking, spread it evenly (important so rice does not overcook in bowl) in a shallow bowl or wood rice bowl and drizzle the flavoring mixture over the rice, mixing it with a plastic rice paddle until evenly mixed. 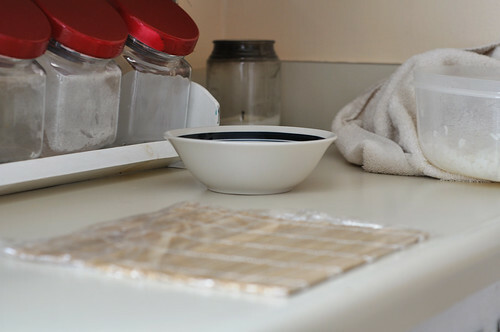 Place damp cloth over the rice bowl and allow to cool until near room temperature. Tip: Mix 1 part rice vinegar with 10 parts water and coat your hands with it while working with sushi rice during preparation and while assembling your rolls. It will prevent the rice from sticking to your hands nearly as much. I think our favorite part about sushi is that each combination has its own personality and makes for a unique experience. 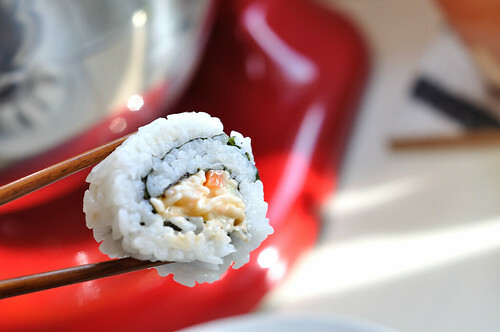 We like our sushi spicy, so here is our fantastic spicy crab filling recipe. 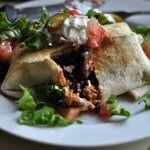 It couples nicely with any sort of veggie you might decide to use. On this occasion we used fresh organic carrot and cucumber. 1. Combine ingredients, stir, and chill until ready to use. To assemble your sushi, all you’ll need is your bamboo mat (we like to cover ours with plastic wrap), the rice vinegar/water mixture, and a sharp knife. 1. 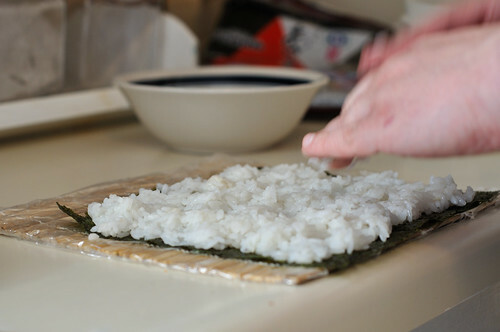 Begin by spreading rice onto nori, leaving uncovered edges at the top and botom. 3. 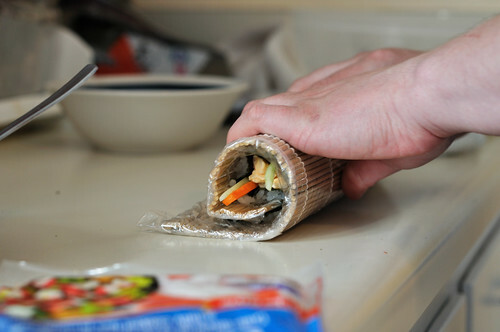 Place all filling ingredients in a light across the lower half of roll. Lift mat from bottom and roll toward the top, squeezing slightly when finished to compact roll. 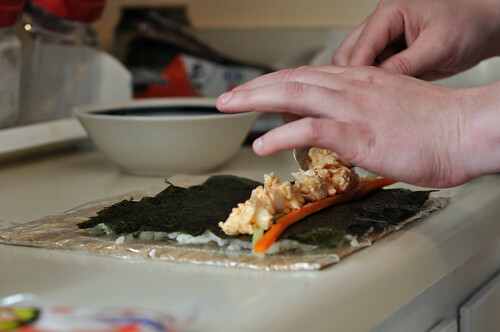 Take care to roll as evenly as possible. To fully complete the roll you might have to unroll slightly to adjust mat and re-roll around the roll, almost like you are forming with clay. 4. 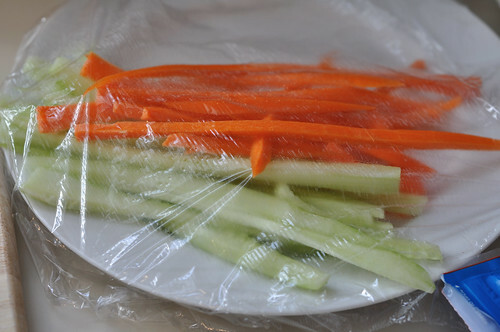 Unroll and place on plate or platter and refrigerate for ten minutes to set. 5. To cut, use a sharp knife and cut evenly in slices. Cut in half, then quarters, then eighths. A very sharp knife is key here. 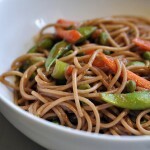 Serve with soy sauce or other dipping sauce or glaze. Note: We cover the roll with wrap and then squeeze it slightly with the bamboo wrap again as it tends to keep the sushi together better as it is cut. Sushi is so much fun because you never run out of ways to reinvent it. We are still learning and trying things all the time, and through the many failures and botched batches of rice have learned so much about the process, history, and ingredients we’ve used along the way. I hope you endeavor to give it a try and see for yourself how easy it can be! 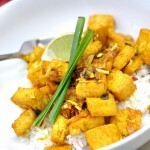 Spicy Vietnamese Lemongrass Tofu Inspired by… Andrew Zimmern’s Bizarre Foods? Remember you can put anything you want in the middle of these rolls. So make it your own and try some new stuff out! Report back and let us know how it goes! My husband and I will definitely have to try this sometime soon. We always spend too much money on sushi when we go out because we can’t get enough! wow! this looks great. i haven’t had sushi in awhile, i need to get some NOW! or make some! Oh God!!!! mine has come out terrible so many times I prefer to go across the street and get it… it’s even cheaper! Wrapping the plastic around the roll is a good tip. When i made my first roll it kept falling apart when I was cutting. Your roll looks delicious! Thanks, and thanks for the mention on your blog! It’s definitely an “aha moment” as they say when it all comes together! I think you could probably use any type of sushi rice, not just jasmine. 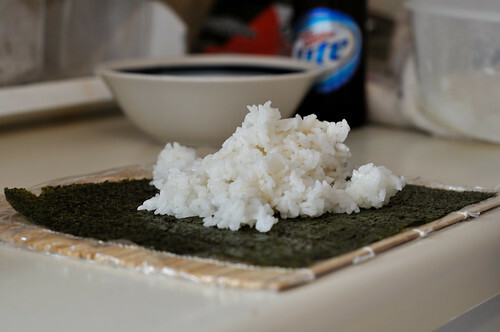 Sushi rice is just short grain rice. You definitely could, we just wanted to be clear about the variety we were using. It’s impossible to predict the specifics people will find useful. 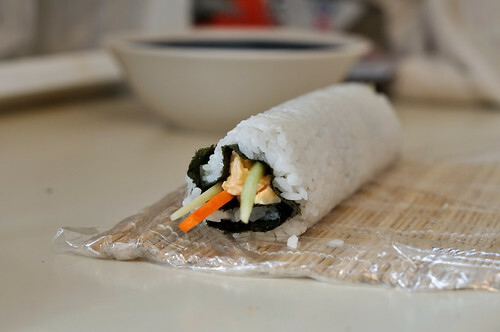 This is my absolute fav sushi roll. 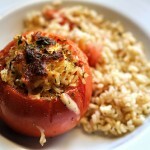 It’s amazing and I could and would eat a few each day if possible! LOL. Thanks for the recipe! I will be trying it very soon. Actually, it seems to hold it’s shape better if you can cut nice, even, 1″ thick slices off of the roll. cutting it into smaller and smaller slices seems to squash the roll as you cut slimmer. 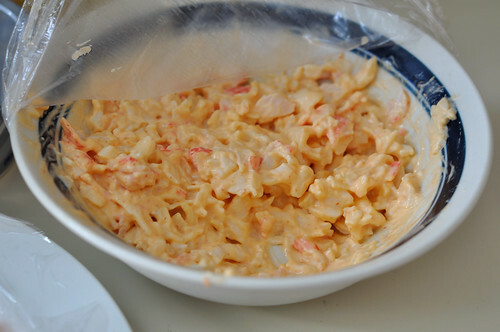 A good ‘stopgap’ for the crab sauce is 1/2 cup of miracle whip, 1 tablespoon of hot sauce (louisiana or southern style… I have used texas pete, crystal, and frank’s successfully), a tablespoon of lime or lemon juice and a teaspoon of lemon zest or half a teaspoon of dried lemon peel. It doesn’t taste EXACTLY like sriracha, but it’s very close and tasty and can significantly reduce the price over traditional spicy mayonnaise. a little horseradish and soy sauce mixed together for dipping and it tastes wonderfully. The tip about slicing it with plastic wrap on works beautifully. 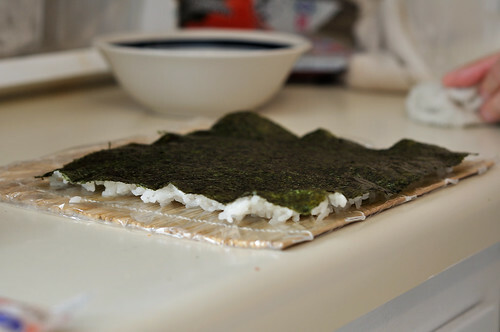 It is possible, using this method, to even make the sushi without Nori if you have someone in your house who doesn’t care for nori… Normal slicing methods for nori-less sushi makes it disintegrate. Amazing! 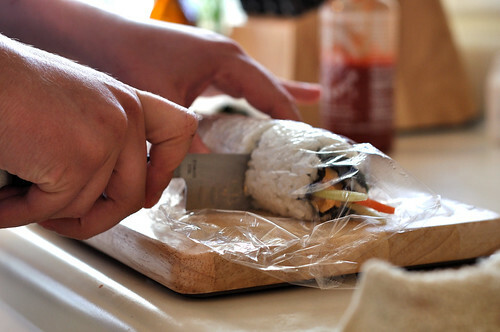 !, Thanks for posting this site, I like sushis, and i want to make one on my own. 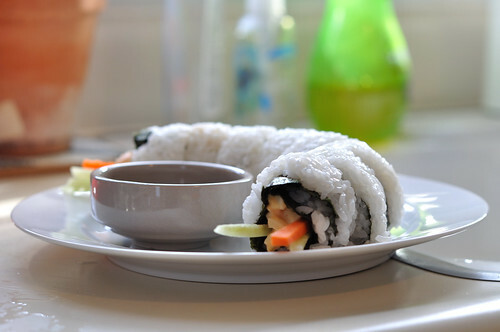 Home made sushis are more delicious like in SoGoodSushi .